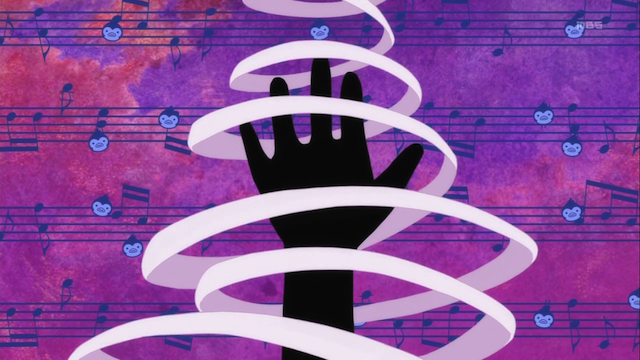 Episode 18 of Mawaru Penguin Drum continues the nearly unbroken string of impossibly brilliant artistic experiences this show has presented us. I said, when commenting on the first episode that this show has the potential to challenge my favorite series of all time. Somehow Kunihiko Ikuhara delivers a mind bending experience week after week. Not only is the subtext intense and frankly disturbing, the presentation is often visually stunning, and the whole thing is suffused in symbolism. This week the focus is on Tabuki, but there is so much more that it is really worth remarking upon. Justin does a great job of collecting links to the various perspectives people have offered through blog posts, so I would urge you to stop by his blog and see where things take you. This week is principally about Keiju Tabuki, who turns out to be quite a tragic figure. In a way, I don’t even want to discuss this episode. It is easy to get lost plumbing the depths of Ikuhara’s symbolism. Take, for example, the grates that we see beside Tabuki in the OP. 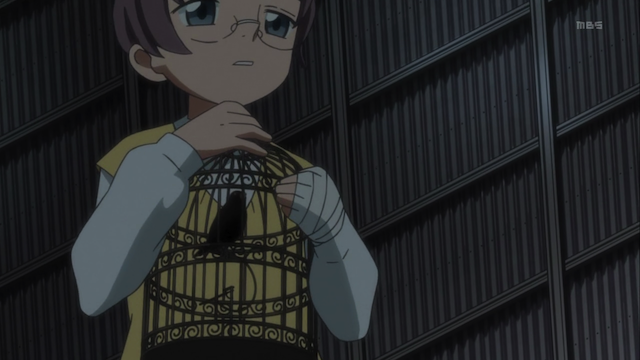 These turn out to be the bars of a bird cage, but they also seem to suggest the grates on the freight elevator that he uses to bring Ringo and Himari up the building. 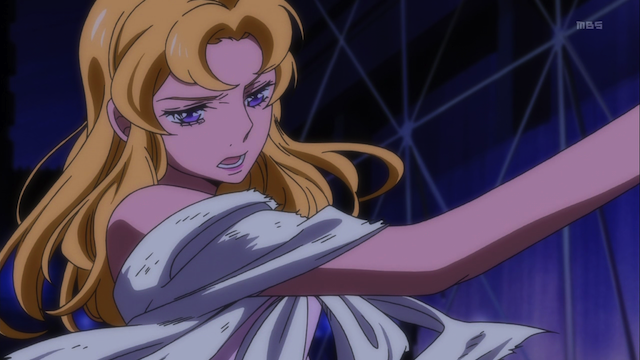 As others have remarked, this scene was visually striking in that it seemed to reference the scenes in Revolutionary Girl Utena, in which the Student Council rode up to their perch. 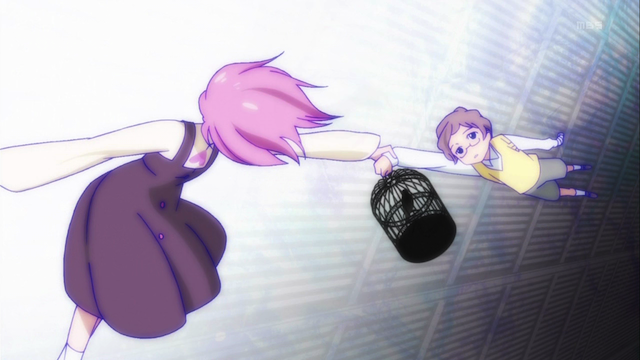 The Student Council were obsessed with “revolutionizing the world”, because they saw themselves as unborn chicks, trapped in an egg; if they didn’t break free from the egg, they would die. 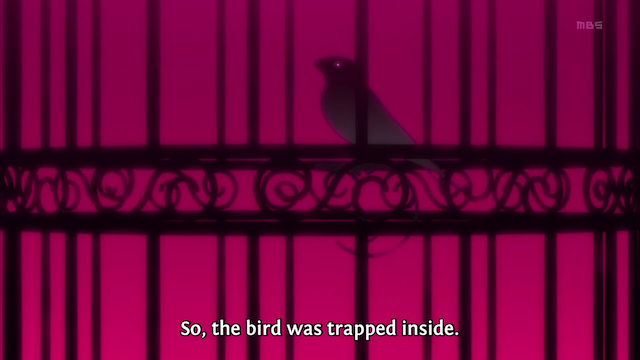 This episode reveals that Tabuki is a tragic figure because he has failed to break free from his egg. Tabuki as a young boy. Abandoned, he clutches the bird cage and heads for the child broiler. Momoka refuses to let Tabuki be destroyed, even though his safety causes her to suffer. Ringo trapped by Tabuki behind the elevator cage bars. AMAZING use of color here! Kanba Takakura fights to save Himari despite the suffering it causes him to do so. Despite being given an extraordinary chance to break free by Momoka, Tabuki finds himself trapped as an adult. Not even his own disgust with what he allowed himself to become is enough to free him. Tabuki seeks to punish the Takakuras for what happened to Momoka. He jeopardizes Himari’s life, and torments Kanba with the witnessing of her death. Kanba, however, surprises Tabuki. 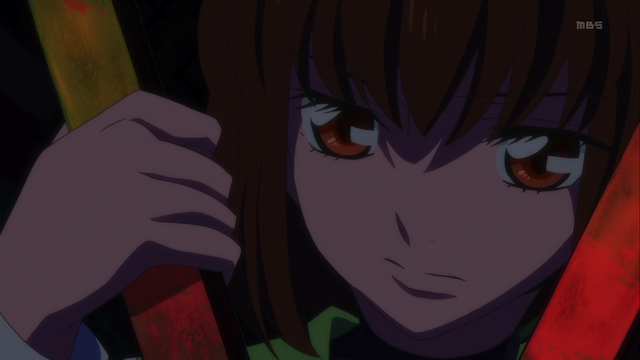 He is willing to accept whatever suffering must come to save Himari, and Tabuki sees Momoka in Kanba’s actions. Tabuki wanted the diary to bring back Momoka, and he manage to recreate her, but ironically it is in the person of one of the people he despises. 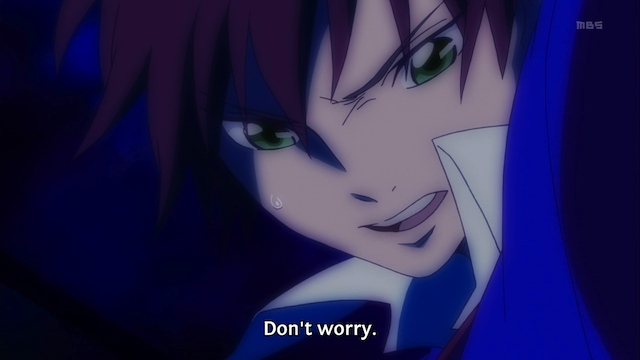 Knowing that what he is doing is wrong, he asks Ringo to break free from the bitterness over Momoka’s death from which he never could. The episode ends with two powerful family studies. Tabuki and his new wife, Yuri, are shown broken. Tabuki denies they even have a family, and for that Yuri slaps him. Meanwhile the Takakuras are nearly destroyed by Tabuki’s hurtful actions, and yet they are together. What is more, Ringo makes a tearful confession to Shouma. The contrast between Tabuki’s family, which seemed held together by a desire for vengeance, and the Takakura siblings, and Ringo, who are united in love is emotional and brutal. The episode then transitions seamlessly to the ED, Grey Wednesday.